Last weekend the Minnesota Capitol hosted its open house to celebrate its recent extensive renovation and remodel project, yet some might be surprised that the 112 year old building is actually Minnesota’s third capitol. 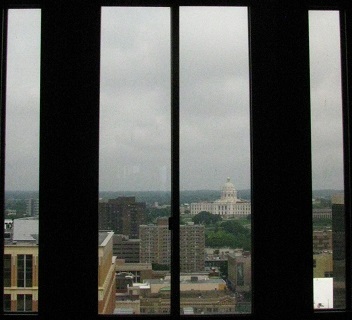 The history and timeframe of Minnesota’s capitols has some interesting parallels to the history of the Ramsey County courthouses. Each has had three buildings, with the present ones standing apart from the rest for their architectural significance and their longetivity. Similarly, their second buildings are both noteworthy for their short lifespans due to dissatisfaction of their users. You might recall that Minnesota’s original capitol burned to the ground in 1881. Built in 1854, it had become a patchwork of expansions by the end of its 27-year life. The second capitol is the one probably most forgotten, for it served in its original capacity for a rather short time. Indeed, the state began planning the third capital in 1893, only ten years after the second one was dedicated. The third-and-present capitol was completed and occupied in 1905, leaving the second vacated after just 22 years. Ironically, this second building served another thirty-plus years as meeting space, storage, and parking until its demolition in 1937. This story of short-lived usefulness is similar to the second Ramsey County courthouse, which at least managed to serve its original function for 43 years before it was replaced and demolished. Minnesota’s trial-and-error history of building a capitol that could function and inspire through the ages is all the more reason to celebrate this recent renovation project. If you missed the festivities, you can always take a tour or check out the excellent restoration photos. Alternatively, track down the new book Our Minnesota State Capitol by Denis P. Gardner.